2P START! Live! 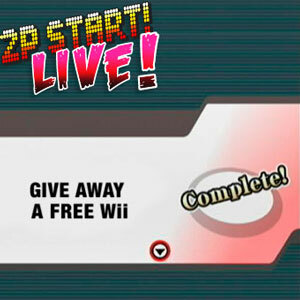 : Free Wii 2nd Edition | 2P START! We weren’t planning on having a podcast at all this week, but we were forced to when… wait… what is it we were supposed to do again? First. i am about to listen to this podcast, but i had to ge the first! acheivement before i did. This is now my favorite podcast. how should i get the information to you and what information do you need? I just want to thank both you guys, Ray and Tim, for making a website that focuses a lot on the readers. I personally don’t mind the Rise from your Grave segment. I mean, it’s always cool to hear my name mentioned on the podcast, but it’s nothing too major. Although, special content is a pretty exciting concept to look forward to. Aw, I didn’t win the Wii or the shirt. But hey, congratulations fierce diety and Moonjuice7! The Musical Misfit was pretty cool, but once again, I’m confused. Harvest Moon is a pretty well-known series, so does that mean the music is supposed to be more vague? Or perhaps just from an older game? Either way, I think I’ll submit one next week. You know, I actually liked the nice, bite-sized podcast. In the instance I get a mic (whenever that is…) I think I’ll aim for 20 to 30 minutes. Anyway, Nice Podcast Guys! And Happy Birthday Ray! I loved the back-up podcast that was just Ray! The only problem is that it replaced the real podcast we were expecting. Rise from your grave has a good purpose, the segment DJ suggested does not. If you’re commenting for the sake of recognition, then you’re using the internet wrong. I also don’t really like the idea of bonus content for “loyal members”. It’s really unfair to the people who haven’t built up a status yet. It doesn’t make them any less loyal, just modest if anything. Oh, when I heard the term “minipodcast”, I expected it to be much, much, shorter than 23 minutes. Needless to say, this is a pleasant surprise. Agreed. I missed the Black Doom Award, but it’s a lot better than I expected. It can be placed after the ‘Ray annoys Tim’ segment! I thoroughly enjoyed the return of the Sonic Hat and the whole drawing section. I think that there is already plenty of stuff that recognizes the loyal fan base. We already have comment of the week and musical misfits every other week. that seems like plenty to me. Congrats to FierceDeity and moonjuice7. Personally, I would spring for the landmaster shirt. This is probably impractical, but I think it would be cool if 2P Start sold Tim beanies. And maybe a book, but that would probably be impossible because of a lack of a standard comic format. A paperback of all the comics at some point would be cool, but totally impractical I think as far as funding and stuff goes. I have to say, I was quite pleased with this podcast. Anyway, note time. 2. Awesome Flipside music by the way. 4. Wait 50 people? I counted, there were only 16. 5. Umm…if this was an example of what unedited podcasts would be like…then I fail to see the problem. 7. I’m like the rebel of Musical Misfits aren’t I? I suggest songs that confuse people. Awesome! AHA! The music was Battle for the Grand Star from Mario Galaxy! I don’t remember that song in the game at all, but I have the Mario Galaxy soundtrack…so yeah. I can’t wait for the premium content…whenever that’s coming. In my book, premium content implies “paid for”, or at least, that’s been my experience, and I don’t think that is the intent here. Not to name names, but there are a couple of webcomics that, as of late, have started having premium content and, I have to say, it’s a bit irritating; if only because it’s new. Actually, it’s more like 90(now), but the sentement is still appreciated. Hey. I didn’t name it. Tim did. When the forums were created Tim said that the forums were for us, but the comments were a direct line to Tim and Ray. So for suggestions for musical misfits and suchlike what do you prefer? Just stick an off-topic comment on a random comic/podcast? Or should we be creating a thread in the forum? I kind of feel that somewhere specific to discus nominations would be better, but not if you guys won’t see them there. Maybe a new forum section would be good? Or some kind of voting system on a single comment thread so people can give a “yay” or “nay” on an idea without having to comment? So for suggestions for musical misfits and suchlike what do you prefer? Everytime I see one mentioned in the comments for any post, I make a note of them in a document I use for the upcoming podcast. So anywhere but the forums basically – as I’m not normally around that section. Thanks! Well, I’ll just reserve my judgment until such a time then. In my book, premium content implies “paid for”, or at least, that’s been my experience, and I don’t think that is the intent here. But it’s almost as bad. It’s content that’s not available to everyone, and that is just not fair. Anyone who WANTS bonus content is a good enough fan to deserve it, if you ask me. And if you make that stuff available to everyone, you can be sure that all the good 2P Start fans have access to it, and that the people are not good fans will leave the content alone. The single pro that making content exclusive has, is that the people who have access to it feel more special. And that does NOT weigh up to the big con of that some people who really want the content aren’t allowed to get it, simply because they don’t have enough “e-cred”. You thought that this weeks complaint about the “Rise from your grave” segment was bad enough to mention, apparently. But that is NOTHING compared to how people left out of the loop will respond to the release of exclusive content, I promise you that. Oh come on Kvb. It’s like extra wallpaper or something or the comic a day early. It’s not like they’re giving away Wiis here. I’m not one of those loyal readers right? A special treatment is a special treatment, Roadj. And based on something very abstract, too. It’s based on the loyalty of readers? Like you can mathematically determine someone’s loyalty by looking at their join date, post count, etc? I know the “premium content” itself won’t be much, but the idea of special treatment itself is where the danger lies. Ranks are never a good thing to introduce to a community. It’s a great way of intimidating new members and make lower ranked members feel unliked. Why can’t we just all be equals? One problem with the e-cred model is that people like me rarely sign in to leave a comment. I have been commenting on and off for a while and quite regularly recently, but I have only left about 3 comments while actually signed in to my 2p Start word press account. I usually just put my name and email in the fields because I can never remember my password and it isn’t worth it to look it up because I have never bothered to find an avatar I like. In any case, I agree with Kvb. the bonus content is only taken advantage of by the more loyal fans. We are the only people who will actually use a 2P Start wallpaper anyway. Why bother making it exclusive? And based on something very abstract, too. It’s based on the loyalty of readers? Like you can mathematically determine someone’s loyalty by looking at their join date, post count, etc? Yeah, I’d say so. If they have tons of comments it’s because they’re on the site constantly. I’d file that under loyal. Maybe not so much the join date, but yeah. And if you ask me, ranks are a good way to encourage new members because they know if they comment on a regular basis they’ll get access to some spiffy items. Crazy about those 50 people thing. I mean, it’ll be crazy because the logging in didn’t happen until after a while right so people might have posted but not signed up and even posted under a different name. MAN that’s a lot of work. Good luck! The Musical Misfit was pretty cool, but once again, I’m confused. Harvest Moon is a pretty well-known series, so does that mean the music is supposed to be more vague? Or perhaps just from an older game? Okay, I forgot to respond to this so I will now. I’ve always taken a Musical Misfit as a song that few people have heard. No matter the game. Hence my Castle Crashers suggestion. And to answer your question about Harvest Moon’s popularity…I’d have to say no actually. It has a pretty loyal fanbase, but it’s pretty small. Not to mention I was the one who recorded and posted that song because no one else had yet. But didn’t Castle Crashers sell pretty well? Last I heard it was one of the top selling games on Xbox Live. I fact *checks game* 780,000 people are listed on the leaderboard at the moment. or even Madden NFL 09 All-Play on the Wii! Where have I been? I’ve been on the forums! Remember, free Dr.Pepper and what have you. Anyway, hopefully i’m back as I’ve missed the comment boards. P.S. Not so much the Rise segment I have a problem with, but risers who dissapear soon after.